Blackstone Audio is proud to present the Oregon Shakespeare Festival’s brilliant production of Shakespeare’s disturbing and psychologically rich masterpiece Hamlet. Whether you’re a Hamlet scholar or being exposed to this work for the first time, this stunning work of audio theater, fully dramatized with performances by the Oregon Shakespeare Festival cast, is a must-listen. In Denmark a king is dead. His brother, Claudius, has snatched the throne, and the widowed queen, yet life goes on—for everyone but Prince Hamlet. The prince, fixated on his uncle as the murderer, is charged by his father’s ghost to avenge the wrong. Disconnected from the foul world around him, Hamlet strains under the weight of his task, descending into madness, both real and feigned. 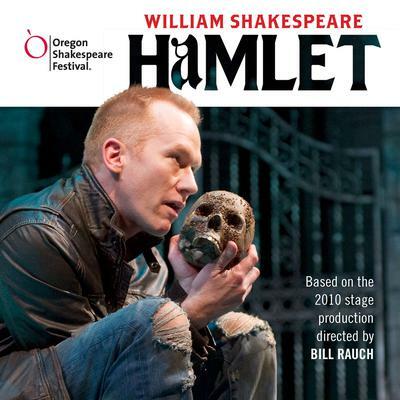 Blackstone Audio is proud to present the Oregon Shakespeare Festival’s brilliant production of Shakespeare’s disturbing and psychologically rich masterpiece Hamlet. Whether you’re a Hamlet scholar or being exposed to this work for the first time, this stunning work of audio theater, fully dramatized with performances by the Oregon Shakespeare Festival cast, is a must-listen. In Denmark a king is dead. His brother, Claudius, has snatched the throne, and the widowed queen, yet life goes on—for everyone but Prince Hamlet. The prince, fixated on his uncle as the murderer, is charged by his father’s ghost to avenge the wrong. Disconnected from the foul world around him, Hamlet strains under the weight of his task, descending into madness, both real and feigned. This version of Hamlet by the Oregon Shakespeare Festival received a Grammy nomination for Best Spoken Word Album, and I can hear why. Adept layering of contemporary music and modern sensibilities over the 400-year-old drama. The brilliant gem in this production is Dan Donohue as the proto-goth Prince of Denmark, with a melodious voice that alternates between evoking goosebumps or making you melt. I felt like I'd never really understood this character until now.